← Am I a Woodworking Snob? I believe in God; if you don’t, keep reading anyway. I didn’t believe either at one time. Not only do I believe, but I’ve considered what He does with what we would otherwise consider bad or unusable things, and uses them to His greater Glory. The greatest of all, is of course, what happened with Jesus. Here God took the worst thing man could do to God – killing him – and turned it into the greatest thing God could do for man – saving and redeeming him. Then we have examples of figures in the Bible of less-than-perfect people being used to do great things – such as Moses and King David, for example. God is quite a turn-around artist! Yes, but how does this all tie into woodworking? Many woodworkers look for the best woods – the most desirable figure, pleasing grain patterns, color, no defects (such as knots) and so on. You can’t blame them; it makes for a much smoother project completion. Then you have guys that want to take what others wouldn’t even consider using for something beautiful and useful, and turning it into something that is just that. The table at left was built from …a single 2 x 4. You know, the things normally used in carpentry work, such as making walls? They cost about $2.50 at Home Depot. They are usually knotty pine, but also Spruce fir as well. Many are far from pristine – knots, twisted, bowed; small chunks missing and pretty ugly. Few are straight and true. They are to the woodworking world what Doritoes are to a chef. But this fellow took on the challenge, and had a dream to do it. To get those gentle curves, woodworkers steam the wood to make it pliable to fit around a form, and secure it there until it cools. Softwoods, like pine, are a real bear to bend, and he makes an accounting of almost giving up it was so difficult. Hardwoods like oak, not so bad. And look what happened. He took an otherwise run-of-the-mill piece of lumber – something that otherwise would have probably ended up in a wall, and made it into something beautiful and useful. Well, that’s what God does a lot of the time too, takes situations and people that we would consider hopeless, useless and senseless, and turns it into something useful, helpful, even healing. 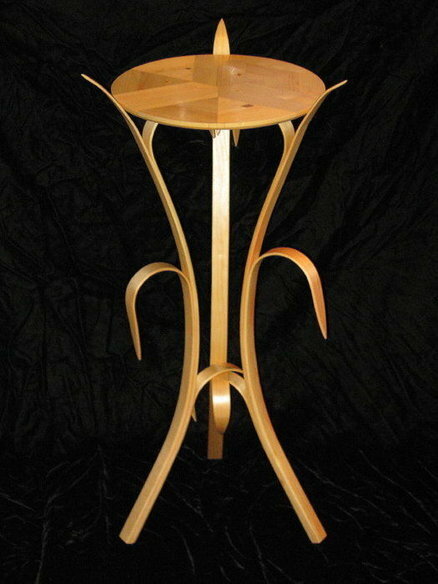 In fact woodworking, on any level, is much like what God does, because by definition, we are taking something raw, and making into something beautiful and useful (usually), or at least utilitarian. Thinking about it, it’s kind of interesting how the Bible tells us that Jesus was a carpenter. In His day, he not only took wood and transformed it into something great, but men’s hearts as well. And that makes Him the true master craftsman.